When we think of Wenatchee, we think of apple orchards and rivers. Winter snow and wine country. Long famous for agritourism and outdoor recreation, Wenatchee has undergone a quiet revitalization in recent years. New businesses are bringing new life to the city. And a few of them happen to be breweries. A trio of downtown breweries have banded together to form Brewers Row: Wenatchee’s Brewing District. Modeled after the success of ale trails throughout the northwest, the Wenatchee Brewers Row is a game in which participants gather stamps to earn their prize: a stainless steel pint. An osprey mascot decorates the passport and pint — inspired by the raptors who thrive along the Columbia and Wenatchee rivers. Long famous for agritourism and outdoor recreation, Wenatchee has undergone a quiet revitalization in recent years. 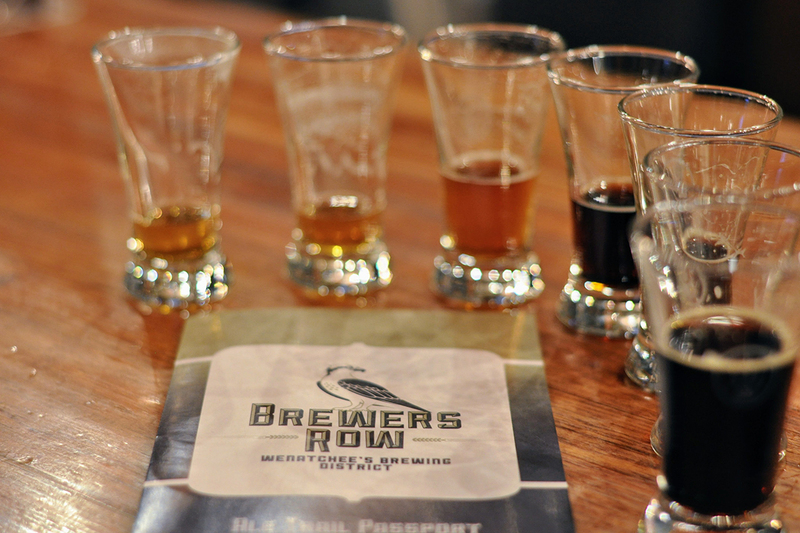 Linked by the scenic Apple Capital Loop Trail along the Columbia River, all three Brewers Row breweries are within walking distance of each other. This is what most appeals to my partner and me as we plan our trip — there’s nothing more convenient than a walkable ale trail. So we set off to Wenatchee in search of beer, discovering a thriving community and a few surprises along the way. Wenatchee’s largest craft brewery is also its most talked about. 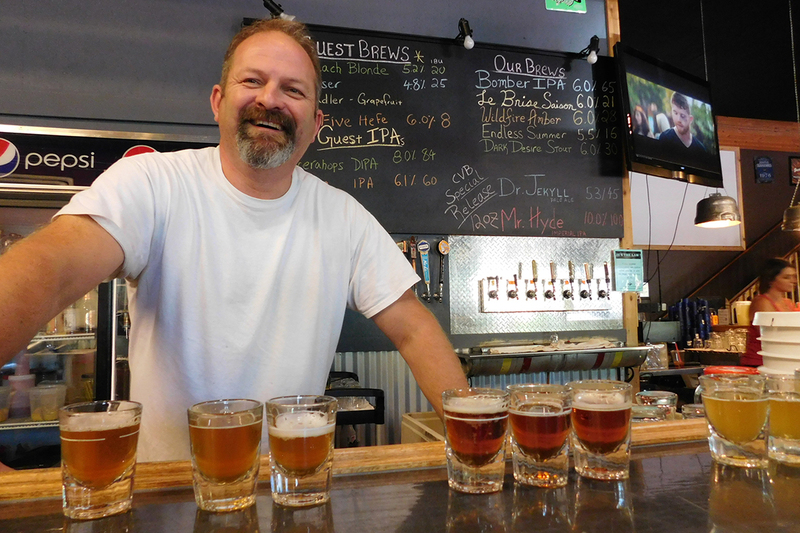 Owner Dave Quick’s name came up in every beer-centric conversation we had in Wenatchee. Nicknamed “the great-uncle of Wenatchee brewing” by a fellow brewer, Dave is one of the most respected brewers in the valley. Take one sip of his beer, and you’ll know why. 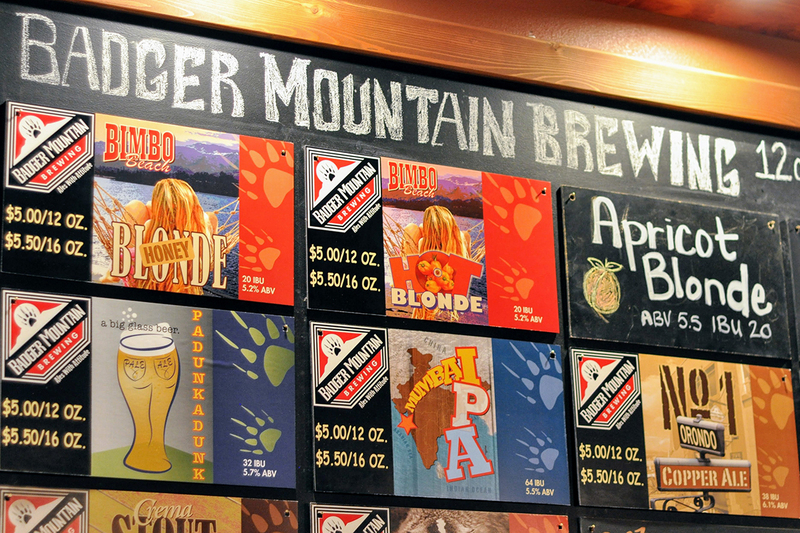 Badger Mountain Brewing opened in an old fruit warehouse building in 2013. With over 20 years experience as a homebrewer, Dave simply decided, “if I don't do it now, I'll never do it”. In other words, he tells us, opening a brewery was on his bucket list. Today, Badger Mountain is the most widely distributed of Wenatchee’s breweries, reaching fans throughout North Central Washington. Their family-friendly pub offers something for everyone, with 24 taps and food to boot. After showing us around the brewery, Dave seats us at the bar for samples. First up: Bimbo Beach Honey Blonde. Named after a local beach, this brew is Badger Mountain’s most popular and does double duty as the base for their blonde series. From the jalapeno-infused Hot Blonde to a Dirty Blonde made with locally roasted coffee, Badger’s blonde series offers quite the selection. Dirty Blonde was our favorite. Its story is a testament to Wenatchee’s collaborative spirit. As Dave tells it, he and the other brewers in town met at the local roaster, Mela Coffee Roasting Company, for a formal tasting. But rather than making a traditional coffee beer, Dave went against the grain. “People usually put coffees in dark, roasty, malty beers,” Dave says. “In the blonde it’s kind of a surprise.” The result is a subtly balanced cold brew flavor — not too strong. This subtlety is an important part of Dave’s brewing philosophy. “I want to know I'm still drinking a beer,” he explains. This allows for a collaborative process in which the younger brewers learn from those more experienced. Today, Columbia Valley operates with a core team of three brewers including Brooke — the only female brewer in the Wenatchee Valley. As a result of this diverse brewing team, Columbia Valley Brewing is especially open to experimentation. They keep four regular beers on at all times, along with fun seasonal varieties and guest taps. Their top-selling Endless Summer Ale is counterbalanced by darker options, ranging from Ridgeline Dry Stout to Hoppy Holiday, a winter strong ale. Brooke is looking forward to releasing Dark Desire next — a dark chocolate milk stout recipe that she’s perfected over the years as a homebrewer. 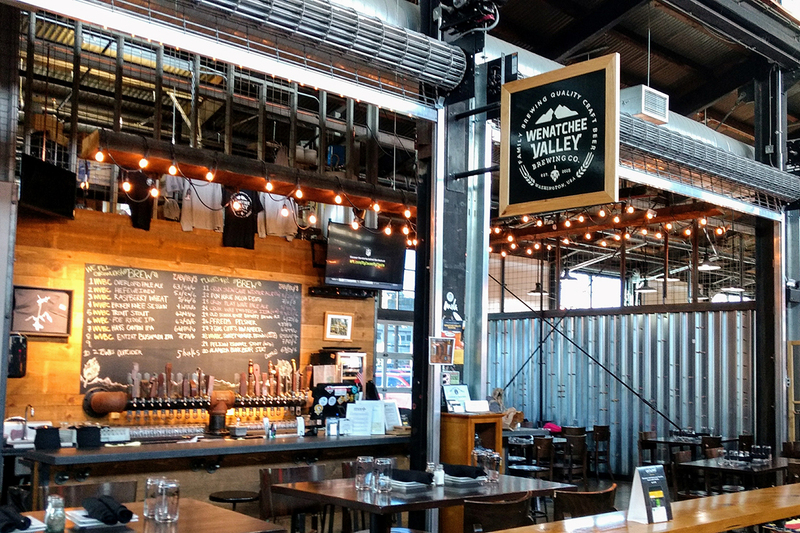 Columbia Valley’s collaborative spirit extends beyond the walls of its taproom. When working with the other breweries in town, Columbia Valley acts as the hub. “We have the system size and location best for these collaborations,” Brooke says. The first Brewers Row collaboration will be an Irish Red for St. Patrick’s Day — brewed here at Columbia Valley Brewing with assistance from Badger Mountain and Wenatchee Valley brewers. An extensive menu and plenty of space make Columbia Valley Brewing a great choice for families and groups. “We are a family pub that really pushes the food aspect,” John says. Choose from salads, pizza, burgers, sandwiches, and 9 varieties of mac and cheese — “nostalgia at its finest.” We can’t argue with that. Our Pitmaster mac and cheese (smoked tri-tip with caramelized onions) and mini pizza make for an indulgent dinner. Family owned and operated, Wenatchee Valley Brewing is the youngest brewery on Brewers Row. With two attractive locations and an eager-to-learn brew team, they’re on our radar as one to watch. Owner Dan Bass, his son Kenton, and Dan’s nephew Jesse Butcher caught the brew bug in 2009, when they started homebrewing in their garage. In 2015 they secured a location in Pybus Public Market to open their first location — a 46-seat restaurant. This location is absolutely worth visiting for its bustling market vibes, “hoppy hour”, and extensive menu. Most of Wenatchee Valley’s beers are on tap here, but you’ll want to go to the source to try them all.After opening their Pybus location, Dan and his team began searching for a brewhouse. They found it in the form of an old house next to Riverfront Park. The space was converted to a brewery in 2016, with brewing equipment shipped in from Hayden, ID. In January 2017, Wenatchee Valley Brewing Co. opened their second location at 538 Riverside Drive. This is where the magic happens. Owner Dan Bass ushers us in on a chilly autumn afternoon for a taste of what Wenatchee Valley has to offer. The brewery feels fresh and new with its shiny steel tanks, warm wood paneling, and attractive industrial design. A limited food menu is available, with appetizers and brick oven pizza. But this is primarily a production facility, and the focus here is on the beer.With Jesse behind the bar and Dan calling the shots, we taste our way through Wenatchee Valley’s lineup, from the no-nonsense Hefe to Sweet Ginger Brown. Many of the beers come with a story. Entiat Bushmen IPA is named after a hotshot crew Dan was on—he’s a full-time firefighter and known locally as “Fireman Dan”. Wenatchee Valley’s signature beer is Overlord Pale Ale, first brewed back in 2009 during their homebrew years. According to Dan, Jesse named it Overlord because “it’s overlord of all the beers." After collecting our stamps, from each of the three breweries, we walk to the visitors center to pick up our prize. We feel at home immediately upon entering — a sensation not typically associated with information centers. What’s different about Wenatchee? The bright downtown space is outfitted with a 1946 Amigos Orchard truck, its flatbed blending into the bar. Wine glasses hang from the ceiling; bottles decorate the walls. This doesn’t feel like a visitors center at all. It’s a tasting room, with Brewers Row beers on tap. Through thoughtful design, Wenatchee brings together its apple capital heritage and modern-day revival under a single roof. We marvel at the concept before heading out — with stainless steel pint in-hand and smiles on our faces. Across the street from the visitors center, our high-rise hotel awaits. 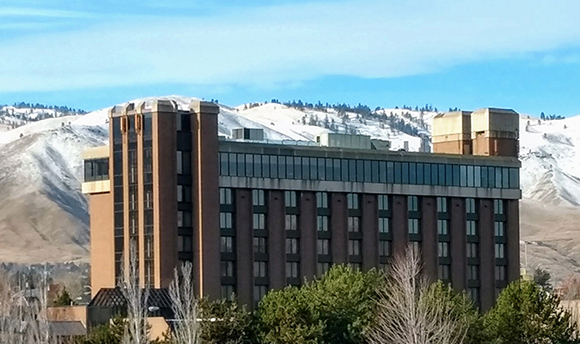 The Coast Wenatchee Center Hotel couldn’t be more centrally located. It suits our needs perfectly — within walking distance of all three breweries, the river, and the market. We settle into a spacious 1-bedroom suite on the 8th floor, with views across the valley to snow-dusted mountains. Late check-out (12pm) is an added bonus for brewery-hoppers, giving us plenty of time to rest, soak in the hot tub, and relax before setting out on another day of adventures. For breakfast in the morning, we walk across the impressive pedestrian bridge between downtown and Pybus Public Market. A short riverside stroll delivers us to the reclaimed historic steel mill. Walking in, we’re immediately overcome with awe. 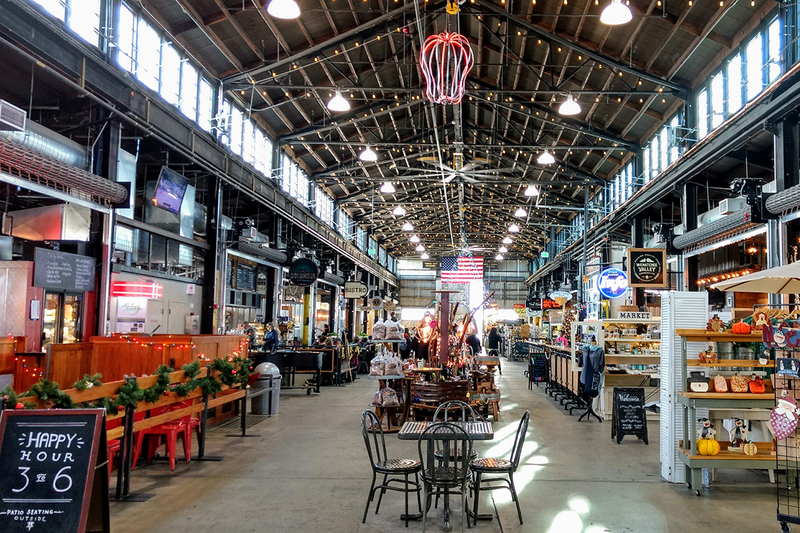 Pybus Market elevates Wenatchee’s old-meets-new spirit to a higher level — a big-city surprise in what we thought to be a tiny mountain town. 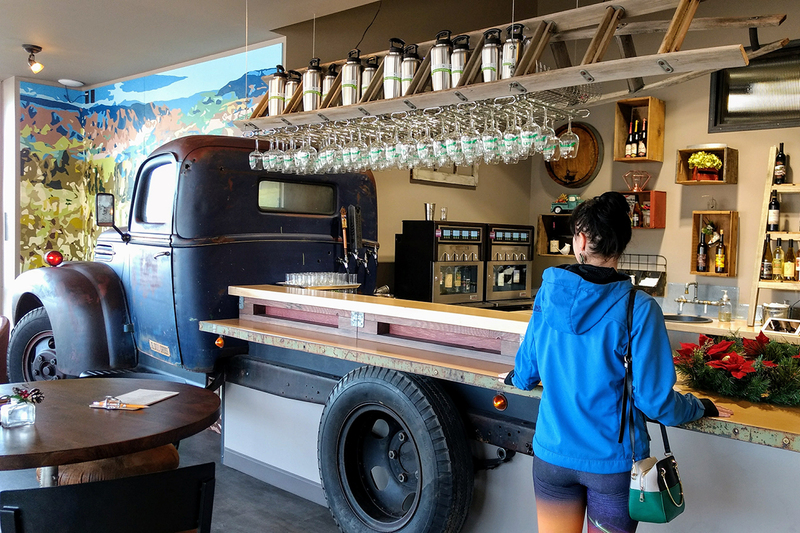 Bursting with independent shops and eateries — including Wenatchee Valley Brewpub — this grand market blows preconceived notions of small-town Wenatchee out of the water. We find it comparable to well-known markets in Seattle and Vancouver—minus the traffic and parking headaches, of course. We take a seat at Cafe Columbia for breakfast (a local hotspot, judging by the line) and tuck into tasty sandwiches before hitting the road. So long, Wenatchee. We’ll be back.